LAUSANNE, Switzerland — The World Baseball Softball Confederation (WBSC) today unveiled the 2017 end-of-the-year standings in the Official WBSC Softball World Rankings Presented by ENEOS. National Team softball competitions experienced record levels in 2017, with 24 new nations earning ranking points for the first time, expanding the WBSC Softball World Rankings Presented by ENEOS from 38 nations to 62, marking an increase of 63% from 2016, following the decision of the International Olympic Committee (IOC) to include softball and baseball at the Olympic Games Tokyo 2020. Four of the five Olympic continents — the Americas, Asia, Europe, and Oceania — had at least one representative within the Top 10, reflecting an elite global representation not common in team sports. Of the 62 nations currently ranked, only six remained in the same position from 2016. 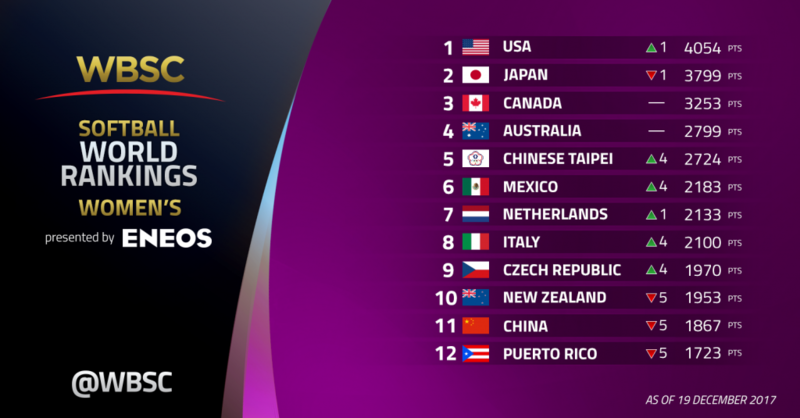 The United States catapulted to the top of the WBSC Women’s Softball World Rankings Presented by ENEOS for the first time since the rankings were introduced in 2015. USA Softball National Teams are the reigning world champions in the Women’s and Junior Women’s (U-19) categories, having won the 2017 WBSC U-19 Women’s World Championship and 2016 WBSC Women’s Softball World Championship, which is biggest contest for the sport outside of the Olympics. USA Softball (4,054 points) overtook rival Softball Japan with a record lead of 255 points. Japan fell to No. 2 with 3,799 points, relinquishing the top spot the nation had held since 2015. Japan finished in 2nd Place at both the WBSC Women’s and Junior Women’s World Championships. Both No. 3 Canada (3,253 points) and No. 4 Australia (2,799 points) hold onto their rankings from 2016. Chinese Taipei, with 758 additional points from 2016, jumped four slots to round out the Top 5. Only 75 points separate Australia and Chinese Taipei. Positions 6-10 are stacked close together with only 230 points separating No. 6 Mexico (2,183 points) from No. 10 New Zealand (1,953 points). This new rankings methodology allowed 24 nations from three continents to earn points for the first-time ever: Aruba, Bahamas, Belgium, British Virgin Islands, Bulgaria, Croatia, Curacao, Denmark, El Salvador, Germany, Hong Kong, Hungary, Iran, Lithuania, Nicaragua, Pakistan, Panama, Poland, Slovenia, Spain, Sweden, Thailand, Turkey, and Ukraine. Two of these nations — British Virgin Islands and Turkey — have never received any points from WBSC (baseball or softball). South Africa re-enters the world rankings after falling off the list in 2016. Denmark is a newcomer to the women’s world rankings, but is ranked No. 13 for men. Ireland — one of 14 nations to increase positions — was the biggest winner to hit an all-time high at No. 20, a jump of 11 positions. Despite dropping two places, No. 29 Uganda now ranks as the top African softball nation. Europe’s Italy and Czech Republic both increased four spots to join the Top 10 for the first time. Next year’s international schedule features the flagship WBSC Women’s Softball World Championship in Chiba, Japan. The winner of the world championship will be awarded 1,150 points and a ticket to the Olympics Games Tokyo 2020. The WBSC Softball World Rankings Presented by ENEOS track a country’s entire National Team performance in all WBSC-sanctioned international competitions over a four-year period, including the U-19 Junior Women and Women Softball World Championships, multi-sport games, continental championships, and friendly series. The web-based version and methodology of the WBSC Softball World Rankings Presented by ENEOS can be found at www.wbsc.org/rankings.